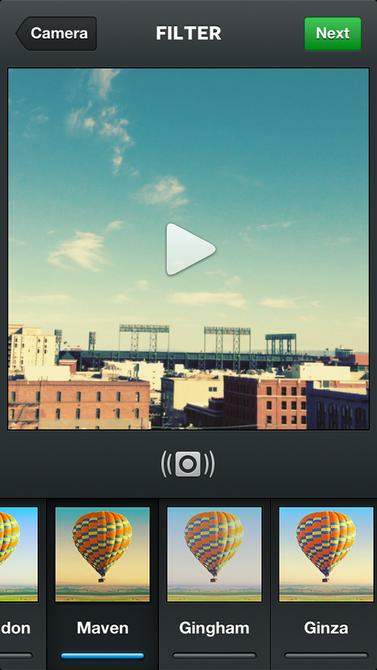 Instagram's new video function lets users record and share up to 15 seconds of video. Instagram users fretting about ads clogging up their image feed can breath easy, at least for now. Facebook said Wednesday it has no immediate plans to put ads in its photo-sharing app -- though make no mistake, they are coming eventually. Facebook CEO Mark Zuckerberg was asked on the company's quarterly earnings call whether users will start to see ads popping up in their feeds, as they do already on Facebook. But growing Instagram's user base and building out the product are Facebook's main priorities, Zuckerberg said. "The focus for now is just to increase the footprint for Instagram," he said, meaning Facebook wants to add more users. But Instagram co-founder Kevin Systrom has always been clear that Instagram, which is free to download, was intended to be a business, Zuckerberg said. "We expect that over time we will generate a lot of profit from it, and that will probably be through advertising," he said. Facebook paid about US$1 billion to buy Instagram, which currently has about 130 million monthly active users, up from 80 million a year ago. Facebook makes most of its money from advertising, but monetizing its services on mobile devices is seen as particularly critical to its success, as more users migrate away from PCs to smartphones and tablets. During Wednesday's earnings call, Zuckerberg didn't mince words on this issue. "Soon we'll have more revenue on mobile than on the desktop," he said. Facebook has been advancing steadily toward that goal since it first started running mobile ads last year. Mobile ad revenue made up 41 percent of its total advertising revenue last quarter, the company reported. That was up from 30 percent in the first quarter, 23 percent in the fourth quarter last year, and 14 percent the quarter before that. But while Facebook may not be running ads on Instagram yet, businesses are still experimenting with it as a way to promote their products, said Sheryl Sandberg, chief operating officer at Facebook. General Electric is a prime example, she said. The company has posted dozens of polished photographs of jet engines, wind turbines and other machinery to its Instagram feed, which is followed by nearly 140,000 people.